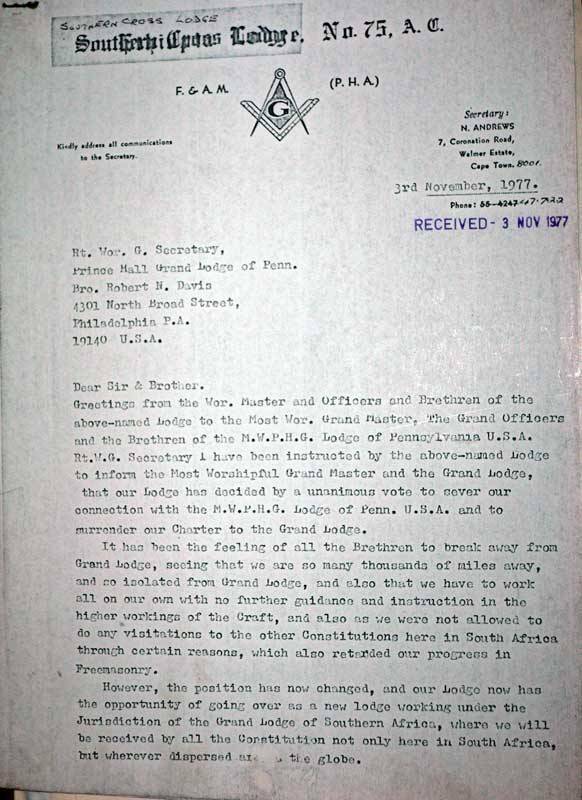 De Goede Verwachting Lodge, Grand Lodge of South Africa. It is a little known fact that during Apartheid in South Africa there was only one organization permitted to fraternize or socialize with Colored people. This organization is Freemasonry. The author talked with R.W. Bro. 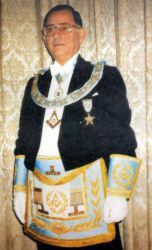 Morris Levin, Past Deputy Grand Master of the Grand Lodge of South Africa and a 33° Freemason who was in charge of the lengthy and sometimes candid negotiations which led to this unique breakthrough. 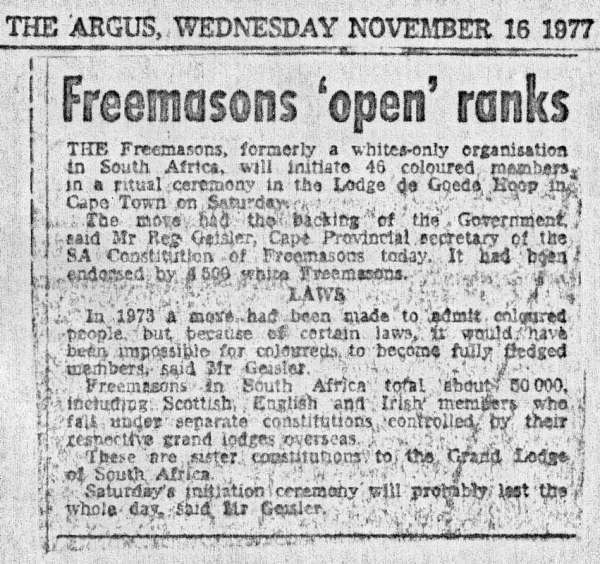 Prince Hall Masonry, which had existed in South Africa for over seventy years, was as yet unrecognized by ‘Regular’ Freemasonry and its members felt isolated from their own Grand Lodge in Philadelphia, USA. R.W.Bro. 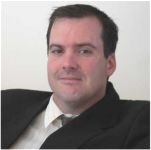 Morris Levin, 33°, O.S.M, is a Past Deputy Grand Master of the Grand Lodge of South Africa and is a life member of the Supreme Council, Northern Jurisdiction, of the United States. He has been honored with the O.S.M (Order of Service to Masonry) award, by both the Grand Lodge of South Africa and the Supreme Grand Royal Arch Chapter of South Africa. He also holds an OM (Order of Merit) from the Grand Lodge of Israel. R.W.Bro. Levin describes the Prince Hall Masons as being “top quality material” and “highly cultured people”, recalling that most of them were teachers, lawyers, doctors and business people. Representatives of the English, Irish and Scottish constitutions, which operate alongside the South African Grand Lodge, were present at the meeting and kept informed throughout the process. 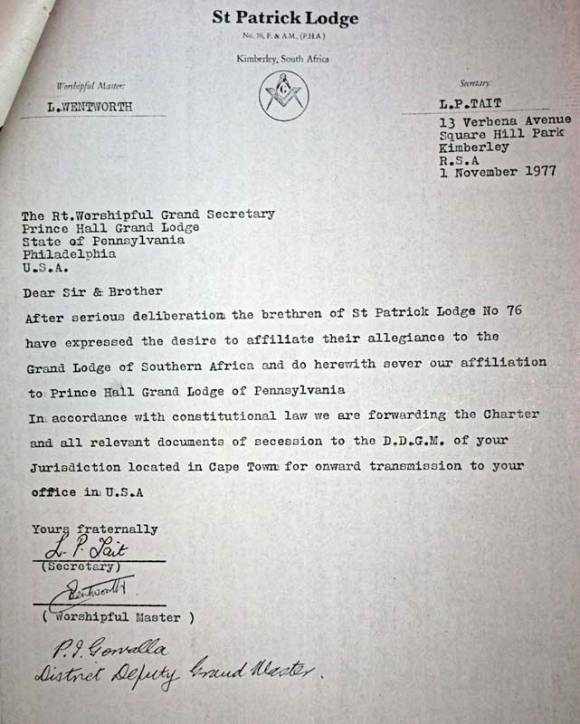 The conditions necessary for GLSA approval (see doc2) required the Prince Hall Lodges to fully surrender their Prince Hall charters (see doc3) and sever all connections with the Grand Lodge of Prince Hall. The members would also need to be re-initiated, passed and raised in accordance with the usages and customs of GLSA. They would also be issued new aprons and given GLSA Diplomas, after which they would enjoy the same rights and privileges as all GLSA members. The next step was to present the case to the government. 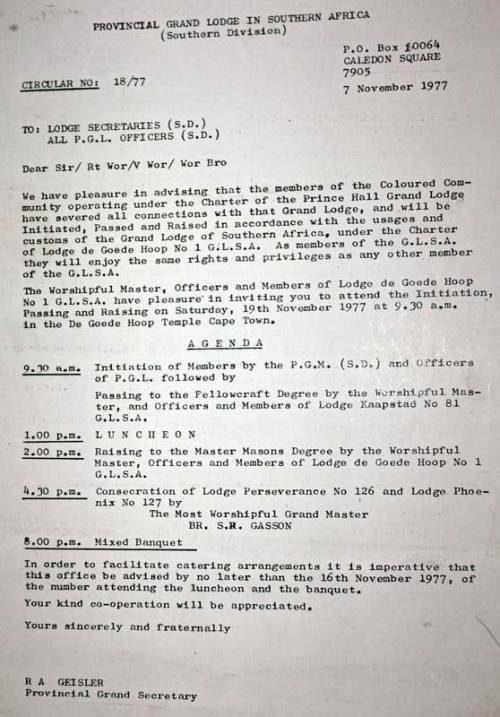 Full membership for Colored people was impossible under Apartheid laws. The Group Areas Act had created separate residential areas to enforce physical separation between races, and the Liquor Act and Assembly Act effectively banned ‘whites’ from socializing or drinking with ‘non-whites’. A document of conditions R.W.Bro. 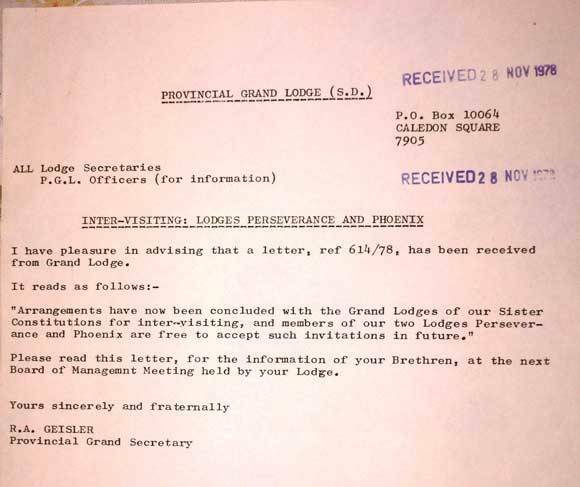 Levin recalls as being “very stringent” in order to “overcome the expected opposition from the government” was produced and the decision to go ahead with the proposal was made on 25 August 1973 at a Grand Committee meeting attended by all commissioned officers and officers of the Grand Lodge. R.W.Bro. Morris Levin was here appointed convener of the negotiations. 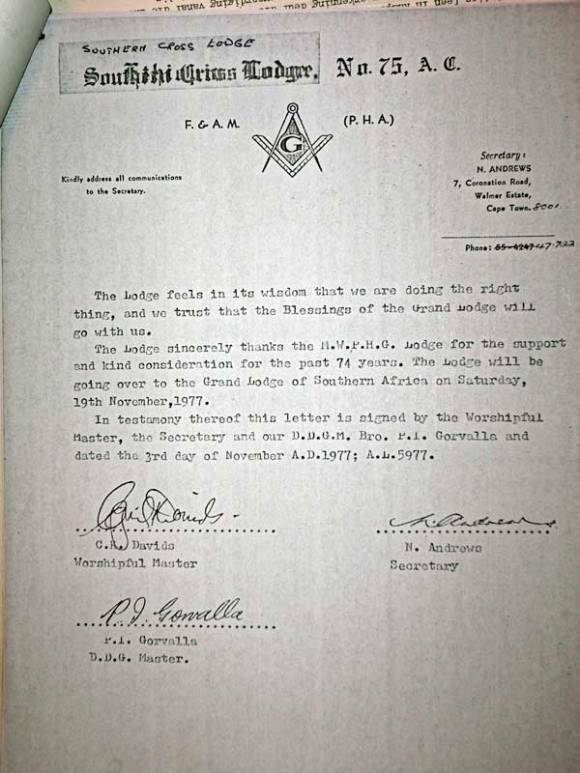 In 1977, after three meetings with a Parliamentary committee held over three years, R.W.Bro. Levin met with the Committee of Internal Affairs. 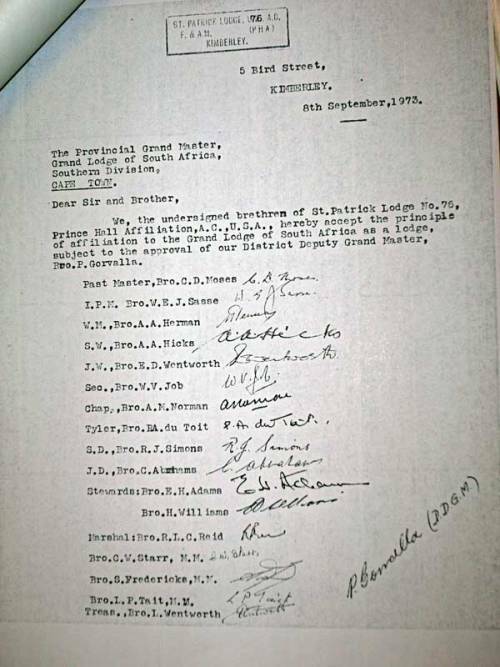 The committee, which included Adriaan Vlok, Dr. Piet Koornhof, Dr. Connie Mulder, Barend Du Plessis and Eschel Rhoodie, were “for the setup” but Prime Minister Vorster was “dragging his feet”. A letter from the Secretary of Community Development was then received which stated that permit authorization was not required for Colored members to attend a closed function such as a normal Lodge meeting held on property owned by the Lodge. These allowances were still not permissive enough for Colored people to be made ‘fully-fledged’ members. Next, a meeting was held with Prime Minister John Vorster and the head of intelligence, General Van Den Berg who urged the Prime Minister to “move it” and grant permission. Van Den Berg did not mention to Vorster that he was a school time friend of the Grand Master, M.W.Bro. Eddie Conradie. 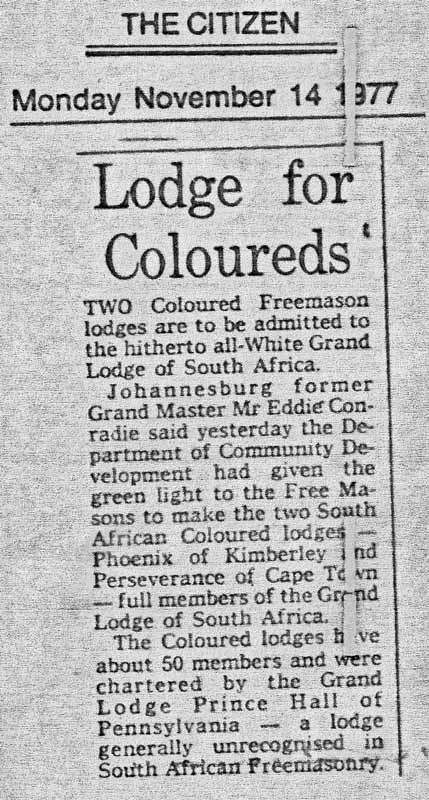 After four years of hard work by many Freemasons and with much help from General Van Den Berg’s involvement, the final breakthrough in negotiations came through an “unexpected support” met during the opening of a home for the aged. Dave Levitan, a member of Lodge Kaapstad, was on “very friendly terms” with Prime Minister Vorster’s wife and she was invited to be the Patron of the home. Many Freemasons, including R.W.Bro. Morris Levin, were present at the occasion and support was found from the Prime Minister’s wife. After hearing Morris’ case - which argued that it was “a worldwide opportunity to show that we are not racist” - she assured him she would see what she could do. R.W.Bro. Levin, who was Assistant Grand Master at this stage, recalls with a laugh that “the next thing we knew we got a letter granting permission!”. R.W.Bro. Levin remembers there were “hundreds of people” and it was “hot as hell”. After all the workings were complete, the new Grand Master, M.W.Bro. S.R Gasson, consecrated the Lodges Perseverance and Phoenix, and a mixed banquet attended by over 400 people followed. 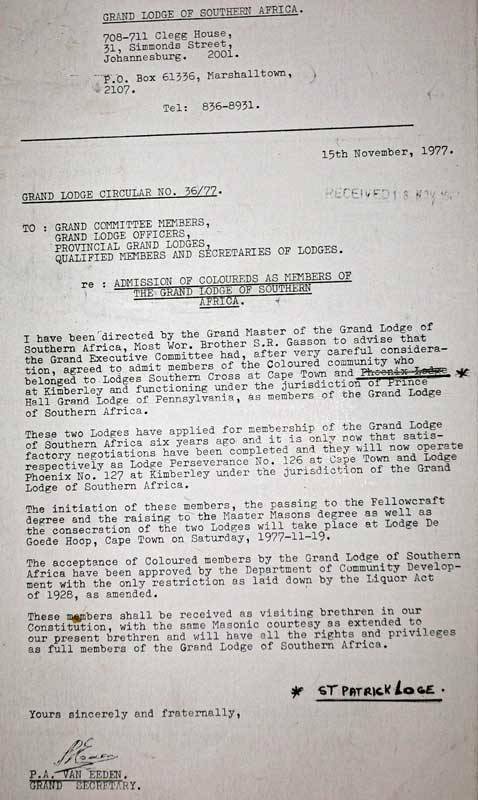 Through the remaining years of Apartheid, it was possible to "accept Colored and Muslim men as full members and many of them have achieved high office in the Grand Lodge" and "many Brethren of color are currently holding office in Provincial Grand Lodges around the country". 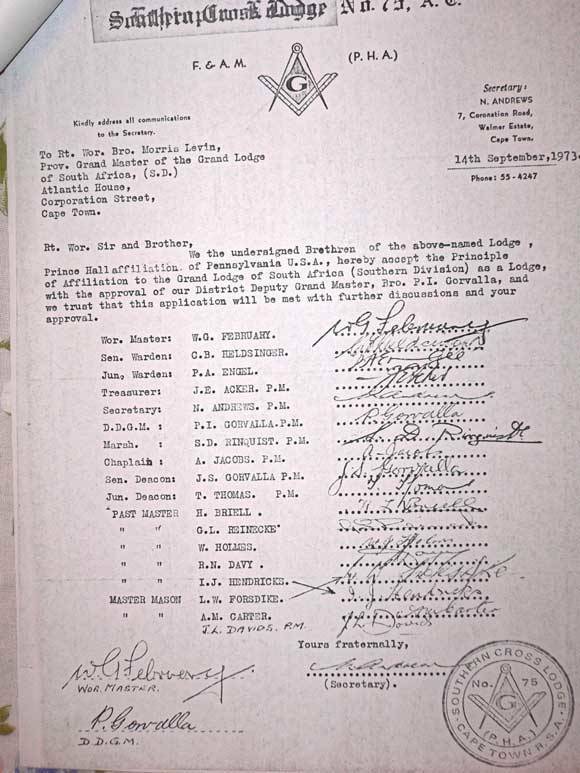 doc1 The Notice given to GLSA by Prince Hall members declaring their wish to join the GLSA. 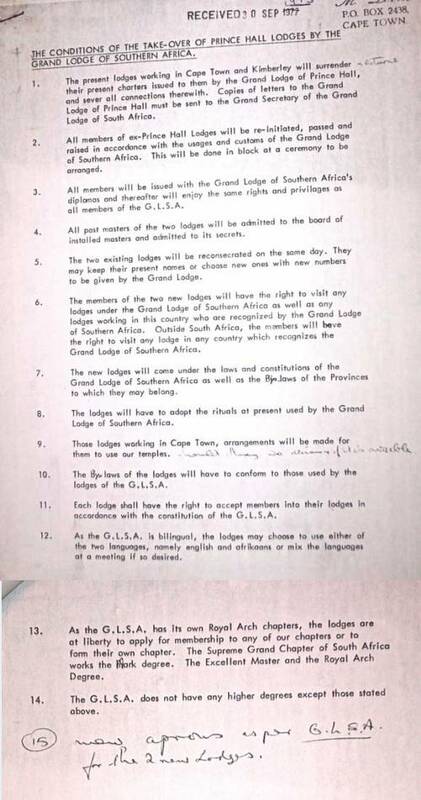 doc2 The document given to the Prince Hall Members stating the GLSA conditions for the takeover.